After graduating from Bharati Vidyapeeth, University of Pune in 1999, Dr. Priyanka completed her International Postgraduate Program in Current Concepts in American Dentistry from the New York University of Dental Science in 2008. She, along with Dr. Tarun and Dr. Bhagat are the founding members of The Sterling Dental Clinic. Along with being a practicing dentist, she holds the title of Chief Marketing and Operating Officer of the company. Prior to The Sterling Dental Clinic, she has worked at The All India Institute of Medical Sciences (AIIMS) and Apollo Clinic in New Delhi. She is a Trained Cerec Dentist, providing One-Day Dentistry for her patients. 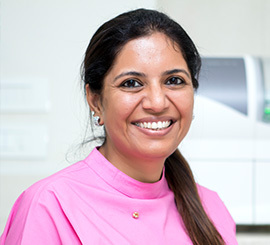 This allows her to design and provide aesthetic crowns, veneers & fillings to patients in the same day and makes her the best CEREC dentist in Delhi. She is highly trained and proficient in this German Technology and is the first private practitioner in Delhi to have this technology in their practice. Always found with a warm smile on her face, she strives to make her patients' dental experience a comfortable one. Also, like Dr. Tarun, she is into spirituality and charity. She dedicates a good portion of her time in taking part in various charitable activities including dental check-ups in government schools and Rotary establishments.